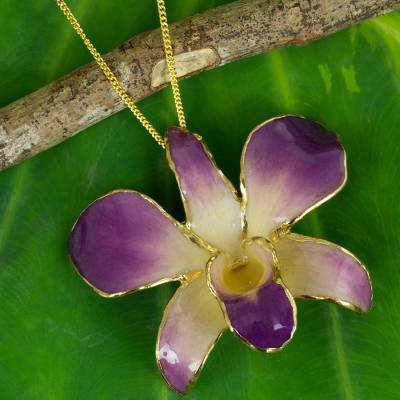 Gold Plated Natural Flower Pendant Necklace, "Orchid Fantasy"
A dendrobium, or rock orchid casts a spell of natural beauty in a necklace by Thailand's Danai. He develops electroplating techniques that allow him to preserve the flower's natural beauty. The 24k gold-plated pendant can be worn without the chain, as a brooch. "My name is Danai Leosawathiphong. I was born March 20, 1949 in northern Thailand. My grandfather was a Chinese immigrant from the Canton province. He emigrated to Thailand at the end of the 19th century when he was in his early twenties. He was a very hard working person and set up a business by the Ping River. He traded goods all along the river and during that time he met my partner's grandfather. "I studied business and left for England. Engineering interested me, and I graduated with an engineering degree from Leeds University. I love England; it is like my second home, quite unique and different from other countries. People from the UK have lovely personalities - you can spot them from far away. I met Ilkay, my wife there. She went to Brunel University where she graduated in polymer science. "In 1976, Ilkay and I came back to Thailand. Originally my family and partner's family planned to do mining. And in order to analyze the rocks, ores and minerals, we needed to set up a lab. Then my partner's father suggested that we could also use the lab to create something to export and generate some income. We decided to offer something representative of the area, and we came up with the idea of covering natural products such as exotic flowers and plants with gold. Well, the easiest way was to experiment with copper. "Starting a business gave flavor to my life. When I look around and see my workers, all providing for their families, it is good for the community. From the very beginning, one of our main objectives has been to employ women. There were so few job offers for women then. We found out that women were talented and hard working. Our first female worker is still with us after so many years. Another main objective has been the environment, because we have to deal with chemicals. We reprocess everything we use and do not throw anything away. All our boxes are made out of recycled paper as well. "I think my products have a lot of potential. I do not think they will go out of fashion, because people generally love flowers. It is so interesting when you work for yourself. For the past 20 years or so, I have had good and bad times but I enjoyed it all. It is pretty much like black coffee – bitter, sweet and very nice."